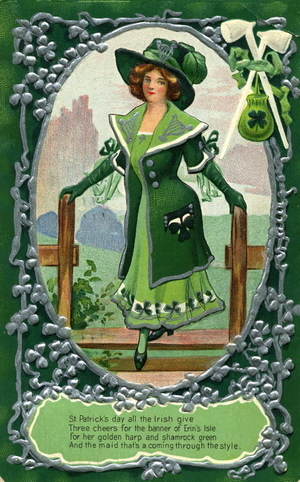 This St. Patrick's Day card was mailed on March16, 1910. You can see how heavily embossed it is by looking at the pattern on the back. 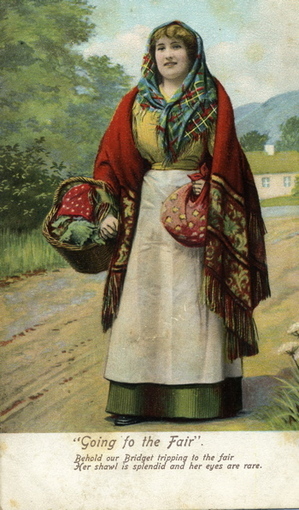 There is no indication of where the printing was done, but many of these multi-color postcards were printed in Germany. The young lady in the picture has a classic Gibson Girl figure: "tall, slender yet with ample bosom, hips and bottom in the S-curve torso shape achieved by wearing a swan-bill corset." 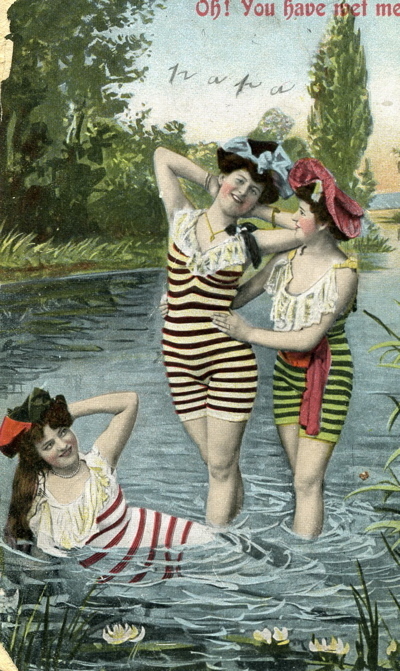 The straight-front corset, also known as the swan-bill corset, the S-bend corset or the health corset, was worn from circa 1900 to the early 1910s . Its name is derived from the very rigid, straight busk inserted in the center front of the corset. This corset forced the torso forward and made the hips protrude. The "style" or stile the girl is stepping through is "a pair of steps or ladders that is accessible to pedestrians but generally inaccessible to animals. Stiles are often found in rural areas or along footpaths and allow access to a field or other area enclosed by a fence or wall." The pipes on the upper right corner are Meerschaums, but I don't know what the green knit bag with the shamrock pattern is. Can anyone help? And how about the landscape in the back? Do you think the artist was trying to evoke the cliffs of Moher? Anyone may feel free to use cards from my collection as long as they remember to credit me (Gail Hapke) and Scribal Terror as the source. From my Well-Fed Irish Girls collection. At a time when famine was at the forefront of the Irish consciousness, stocky young ladies like Bridget were the height of desirability. Notice how her waist is cinched in, though. She must be finding it hard to breathe! "Bridget" belongs to my collection of antique (probably late nineteenth- to early twentieth-century) postcards, which I've been scanning and archiving. Since a lot of them are from Ireland, I thought March would be a good time to start. For historical purposes, the backs are pretty interesting too, so under each one I'm also putting up small thumbnails of the obverse side that you can click on to enlarge. If you want to see them all once I'm done, they'll be archived under "Postcards." You also have my permission to use them as long as you credit me (Gail Hapke) and Scribal Terror as the source. The phrase "morn's morning" is an interesting one. Originally the word "morning" meant the beginning of the "morn" (the early part of the day), so the "morn's morning" would be sunrise -- the morning of the morn, also known as the "top" of the morning. This postcard was sent by my great aunt Ida in Racine, Wisconsin, to her sister Laura's husband, John Jamison, in Cincinnati, Ohio, on March 15, 1910. John was a native of Ireland, and a splendid-looking mounted policeman. I have pictures of John on his horse, which I'll publish later -- as soon as I dig them up. The text of the message is "Dear John don't this remind you of Ireland and those canes you brought along. with love from Ida." The card was printed in Germany, the place to go for fancy color printing. 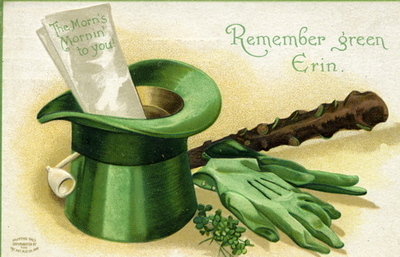 The card is also embossed, with the hat, gloves, and cane standing out a bit from the background. I think the pipe is supposed to be Meerschaum, the hat beaver, the gloves kid, and the shillelagh blackthorn. The combined effect is one of wealth. Oh, you have wet me! I'm beginning to scan and archive my collection of antique (probably late nineteenth- to early twentieth-century) postcards. This is one of my favorites. -- Why do suppose they're wearing hats? Did people really say things like that back then? Did the girl in the middle forget to shave one underarm or is there a ferret on her shoulder? I'll be putting the rest of these up over the next few weeks. Since a lot of them are from Ireland, I thought March would be a good time to start. For historical purposes, the backs are pretty interesting too, so under each one I'm also putting up small thumbnails of the obverse side that you can click on to enlarge. If you want to see them all once I'm done, they'll be archived under "Postcards." You also have my permission to use them aas long as you credit me (Gail Hapke) and Scribal Terror as the source.